Most of us probably have our own Amazon Prime account. With all the benefits why would you not? Now, if you have children, they will probably be wanting to use some of the features it offers– most likely the streaming video service. Great!…Right? It can be if you have set up your Amazon Video PIN. If not, you might notice your children have been watching videos they should not be. We are talking about R-rated movies or even something that you do not think would be appropriate for your kids. Another issue could be on your next bank statement where you might see some charges you do not remember making (enter cash register sound here). Being a parent in this technological world can be very hard: one, we want to protect our children from things and two, we want to keep our checkbook happy. 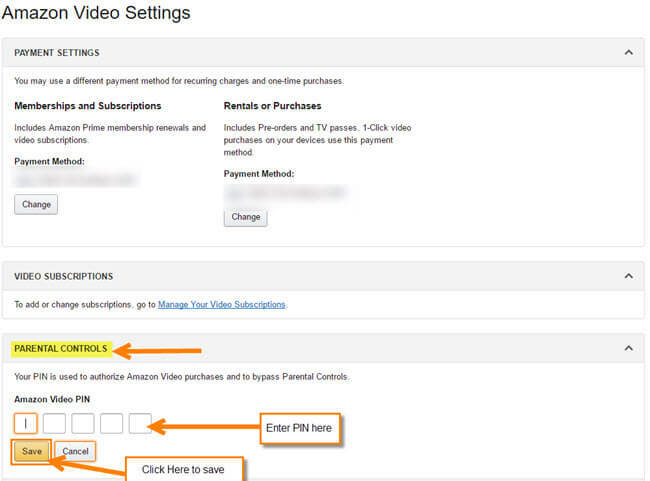 How do we set up or change our Amazon Video PIN (and yes, if your kids crack your password, you will need to change it)? Glad you asked this question. 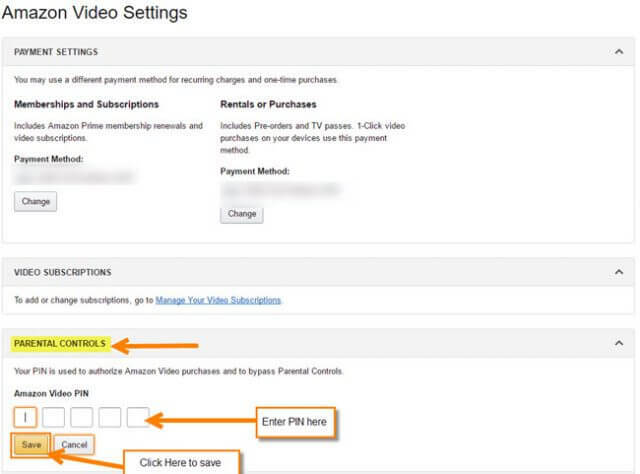 From one parent to another I will show you how easy it is to set up or change your Amazon Video PIN. Step 2: Once signed in, look to the top-right where it says Hello (your name here) and hover your mouse over it. 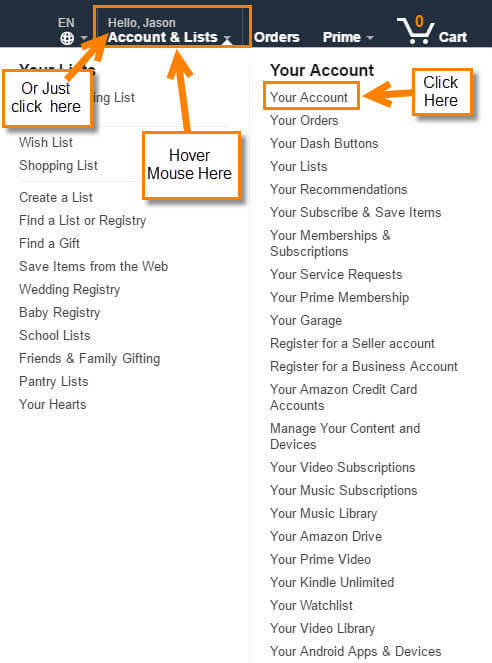 A menu will appear and now you will need to click on the Your Account link on the right. Quick tip: You can click on your Hello (your name here) area and it will take you to the Your Account page, too. If your screen does not look like the one above it, might look like the following image. Same steps, but you will need to scroll down a little. Here you should see the wording Digital Content on the left. 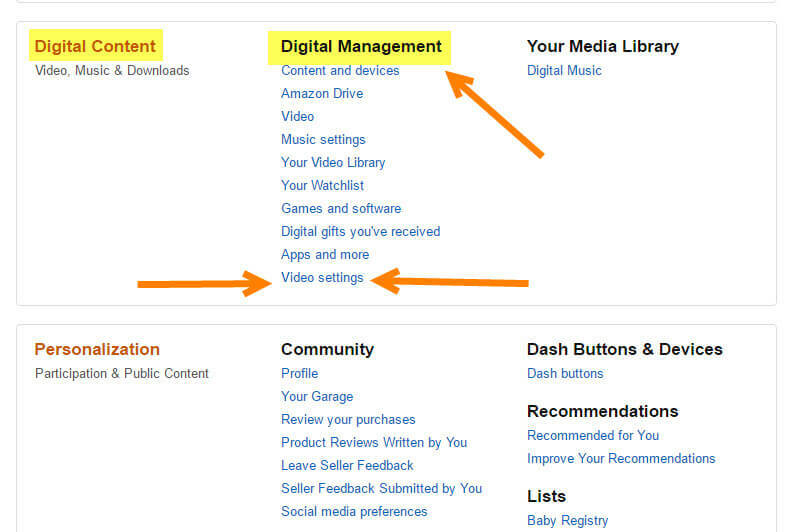 In the middle, you will then see Digital Management and under that is where you will find the Video Settings link. Click it. 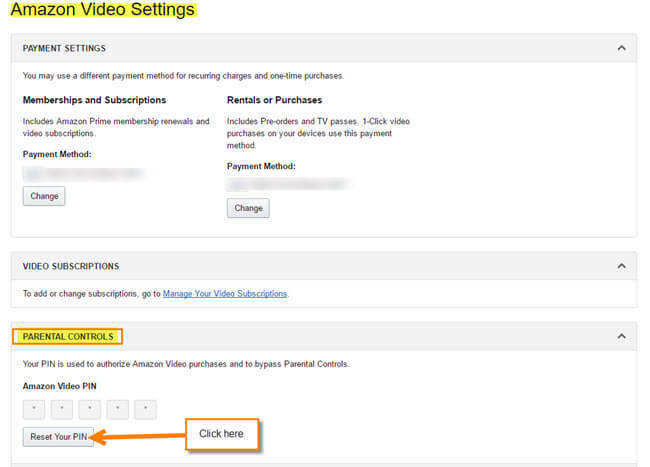 Step 4: We are on the Amazon Video Settings page. 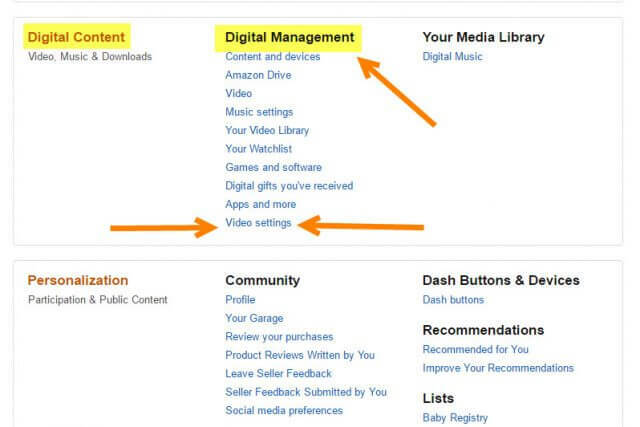 From here you are going to look under the title Parental Controls. This is where you can set your PIN or change it. Click on the button Reset Your PIN. Step 5: This will now let you enter your 5-digit PIN (make it a good one your kids will not guess). After you key the number in, click on the Save button. You will now see some green wording saying You’ve changed your PIN. You now have a PIN set up so when your kids want to watch a video or purchase one, they will need to ask permission. I think a bunch of chores need to be done and then, maybe, type the PIN for them. Do not give it to them or you will need to change your number again. Do you have any stories about your kids using your Amazon Prime Account? Thanks for the info Jason. Do you know how to reset the pin if I have forgotten what it is? You are welcome!! 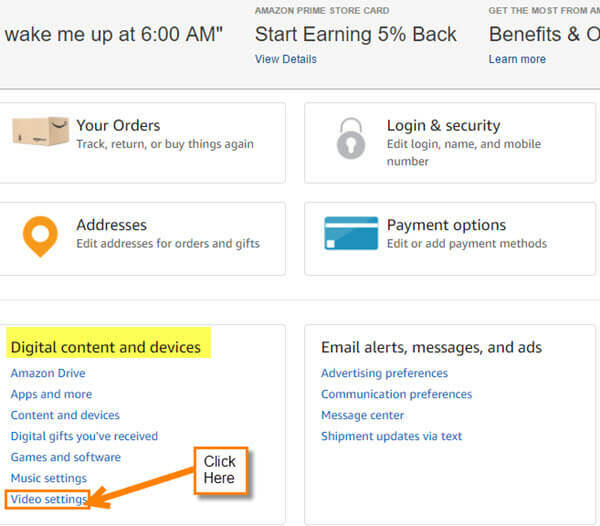 To reset the PIN you just have to log in to your Amazon account again. 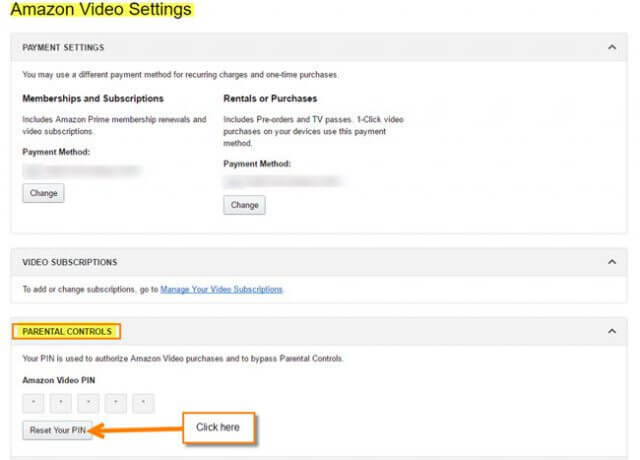 Head to the Amazon Video Settings just like you did in this article. Under the Parental Controls you will notice the button that says Reset Your PIN just click that and you will be able to setup a new PIN.This is the way you do it if you forget your PIN. I forget mine very often ;). I hope that answers your question.